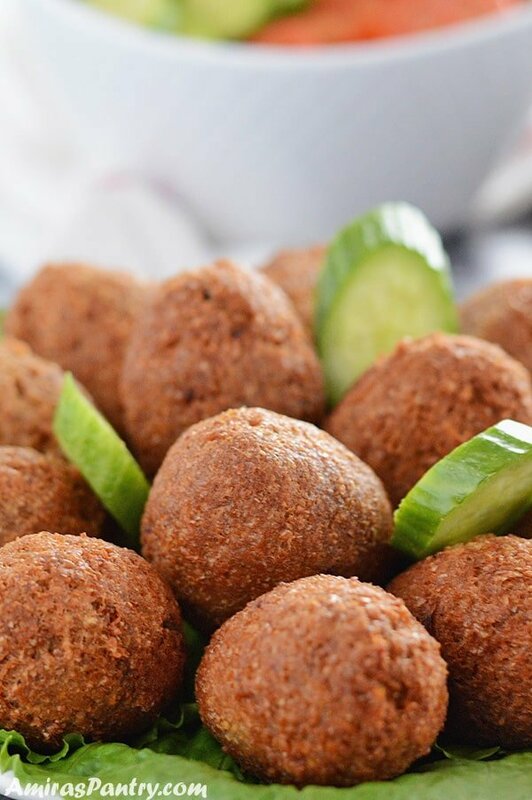 Kibbeh are addictive nuggets with an out of this world taste and texture. Crispy shell outside with a succulent meaty filling inside. Literally a meat bonanza that everyone loves. Kibbeh recipe is an outstanding use of meat as it is simply stuffing meat with another meat. The bulgur is what makes this dish stands out from the ordinary kofta. Traditionally, its presence on the table meant only one thing: major celebration. it was otherwise too labor intensive not to mention costly. This post has been updated from the original September 2013. Last updated January 2019. 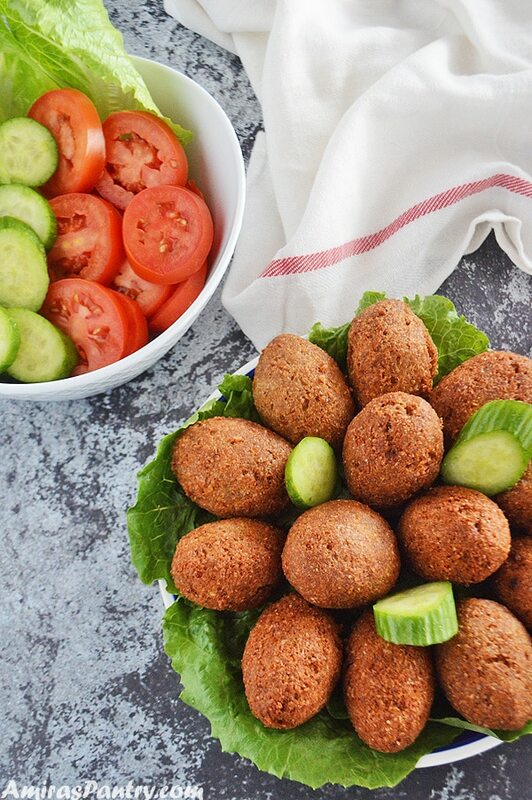 Kibbeh in all its forms, raw, fried, broiled, stuffed, baked, and vegetarian is a defining dish for the Lebanese and Syrian cuisines. It is very popular in the eastern parts of the Mediterranean. The most popular form is this one, a hearty croquette. A mixture of ground meat, onion, pine nuts and delicate spices, is stuffed in another mixture of bulgur, onion and ground meat. 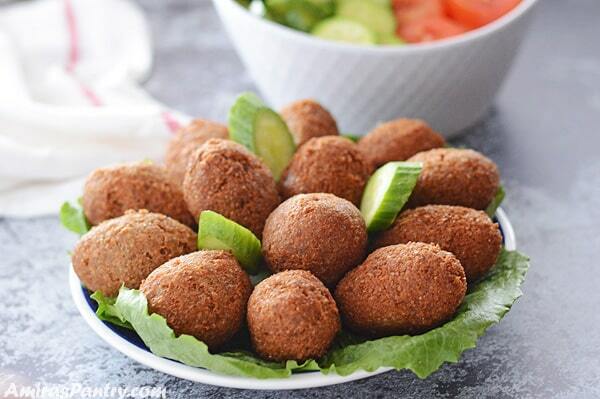 Kibbie (also sometimes spelled Kibbee), is made traditionally with lamb or goat meat. Recently it has been popular to make it with beef and I have done it in the past with ground turkey as well. What is kibbeh made of? Kibbeh ingredients are divided into two lists. One for the shells and another for the stuffing itself. Here is what you’ll need. 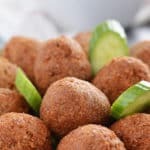 Is raw kibbeh safe to eat? Raw Kibbeh or Kibbeh Nayeh is a quintessential Lebanese dish. It ia made by kneading together ground lamb or beef, bulgur, onion, spices and cold water. Fresh meat, no fat or gristle, and sparkling clean sterile blades are a must if you will eat raw kibbeh. You need to know the butcher and you’ll need to tell him that this is going to be eaten raw to make sure no cross contamination occurs. Of course ready packages of ground meat will not work in this kind of kibbeh. What do you eat with kibbeh? Serve Kibbeh with tzaziki sauce, tabouli, tahini dip, or fattoush. You can also serve it with simply some slices or onion, cucumber and tomato. 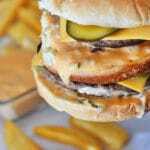 It is recommended to use lean ground meat, I try to go for 91-93%. Shaping kibbie like this needs some skill. You can simply form into a ball then re-shape it to look like a football shape. Although this is an easy and more simple way it always yields uneven shell. It will still taste delicious though. Freezing before frying is considered a “best practice”. Frying Kibbeh is a very delicate and some how complicated process. You may have the best recipe in the world but then it breaks apart in the oil or pops open. I’ve included a frying guide as detailed as possible. In a non stick pan over medium high heat, add oil and heat for a minute. Add onion and saute for two minutes or until translucent and fragrant. Add meat, break it apart with a spoon until it browns nicely all over. Add the spices, season well and adjust salt according to your linking. Add pine nuts, some people like using different kind of nuts or a combination. Pine nuts and walnuts are most common. Turn heat off and mix everything well until combined. Set aside to cool down. In a deep bowl combine bulgur and water. Mix water with bulgur, cover and let it rest for 30 minutes. You can make the filling at this time if you want. In picture 3&4 above, add the rest of the shell ingredients and mix well with hands. 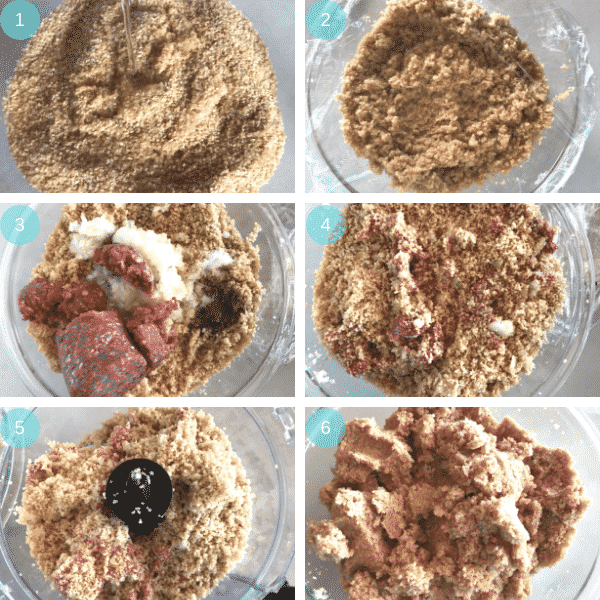 In a food processor, add mixture in batches and process until everything is mixed well together. Mixture should be soft and uniformed. You can process the whole this 2-3 times until you feel everything is well combined. 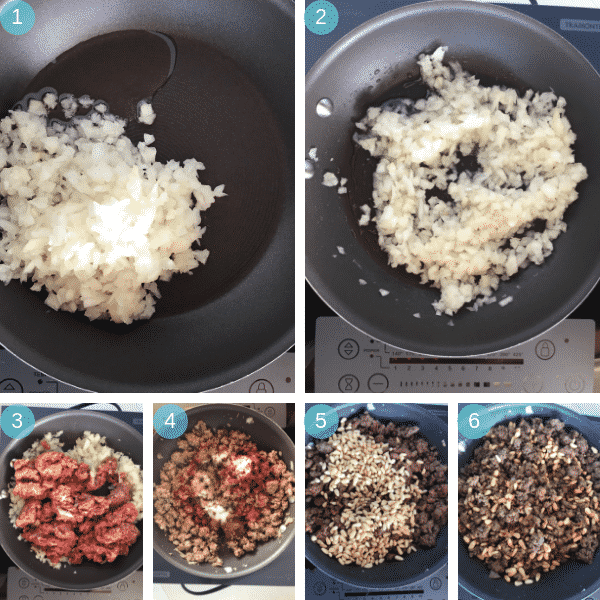 Some people like to process the ground meat first then add it to the bulgur and the rest of the ingredients then process again. Take a small ball, the size of a golf ball in your hand and roll. Hold the ball in one hand, and with the index finger of the other hand poke the ball on one side. Roll the ball in your hand while pressing with the index finger of the other hand to make a hole and widen it as much as possible like shown above in 3 & 4. Now take some of the meat stuff we already made and stuff the ball. Close the ball by pinching the open end and roll in your hand to get the football like shape. Place the kibbeh on a baking sheet liked with parchment or foil and freeze until firm. When you are ready to eat, heat enough oil to cover kibbeh. 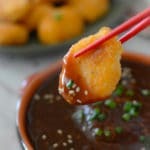 Use deep enough pot for frying and do not fill more than 2/3 with oil or else the oil will bubble then rise to the sides and spill all over the stove. To know if the oil is hot enough to fry kibbeh, simply dip unpolished wooden spoon or chopsticks in the oil, if it bubbles moderately like shown above then your oil is ready. 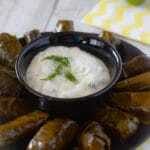 Carefully add the frozen kibbeh to the oil, fry on high for 1 minute then reduce heat as directed below in the recipe. Please be careful as the oil will be hot and the kibbeh is frozen. Now serve hot and enjoy every bite of it. It is indeed a labor intensive recipe, but trust me you will love it. This is a freezer friendly recipe and a make ahead too. Make enough and freeze for up to 3 months, take out and fry as much as you need. Forget about meatballs and make this Lebanese Kibbeh recipe with ground beef. 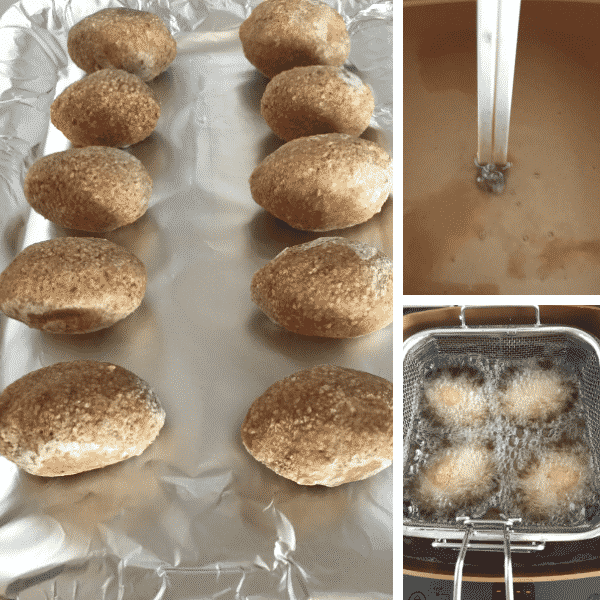 A step by step guide to how to make, shape and fry kibbie like a pro. 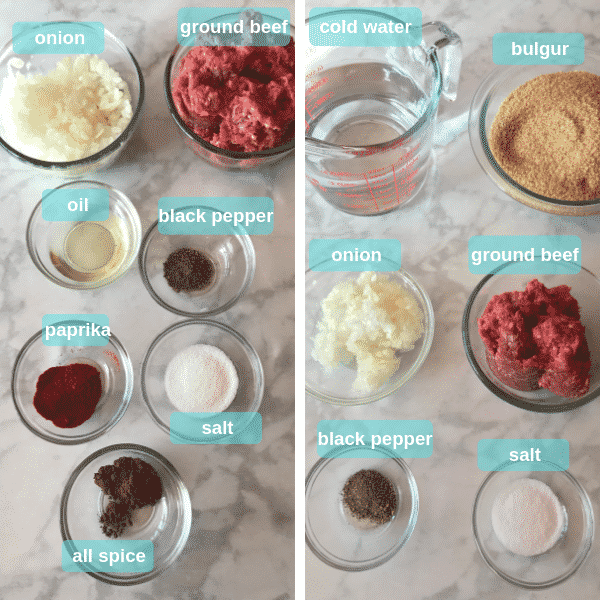 Lebanese Kibbeh recipe with ground beef. 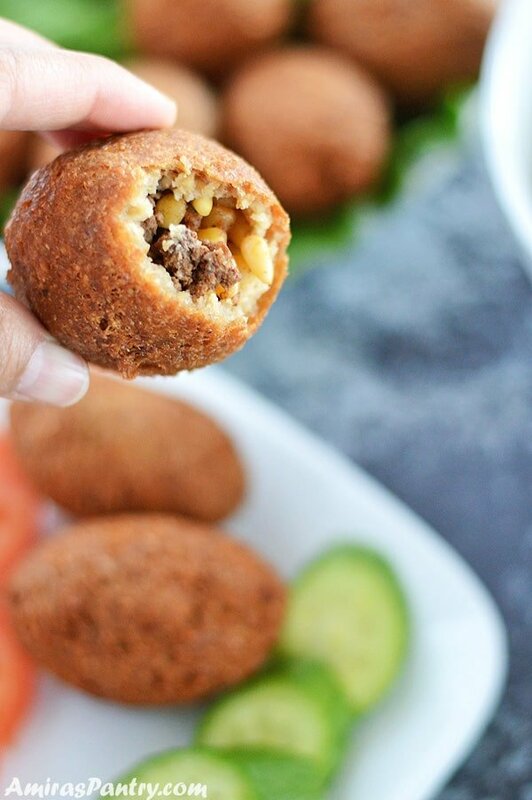 A detailed guide of how to make, shape and successfully fry kibbeh like a pro. 1 pound (454g) #1 fine bulgur wheat, unwashed. 1 1/2 (360mL) cup cold water. 1/2 pound (227g) lean ground beef or lamb. (Note1). 1 1/2 teaspoon (10g) salt. or to taste. 1/2 - 1 teaspoon black pepper. 1/2 cup (100g) onion, diced. 1/2 cup + 2Tablespoons (180mL) water. 1 cup (200g) onion, diced. 1 pound (454g) ground beef. 1 1/2 teaspoon (10g) salt. 1 teaspoon (3g) ground all spice. 1 1/2 teaspoon (4g) paprika. Iced water for shaping and forming. In a deep bowl, add bulgur and pour water over, cover and let it soak for 30 minutes. In a large skillet, over medium heat add oil and sauté onions until translucent. Add the ground meat and stir until it is browned. Add the seasoning, mix well. Turn heat off and stir in the pine nuts. Add the onion, ground beef, salt and pepper to the bulgur and combine well. Transfer the mixture to the bowl of food processor in batches, adding a couple of tablespoons of water each time. Make sure to scrap down the sides of the bowl. Fill a measuring cup with cold water and add some ice. Prepare a backing sheet and line it with parchment paper and set next to you. Lightly dip your hands int he cold water and take about 3 Tablespoons of the shell mixture then roll into a ball the size of a golf ball. Place the ball in your left hand and using the index finger of the other hand poke a small hole in one end of the ball reaching to the middle of the ball. Gently roll the ball into your left hand while pressing your index finger in a circular motion. Keep doing this until the hole is bigger make sure not to press too hard on the walls of the kibbeh so it will not break or tear. (Note 5). Now take about 3/4 teaspoon of the filling and fill the hole of the kibbeh, do not overstuff. Place the kibbeh on the baking sheet and continue until the whole batch is done. Cover and refrigerate or freeze until firm (Note 7). In a deep frying pan add oil enough to cover the kibbeh when put in it. Add frozen kibbeh, and be careful as the oil will be hot. Do not cram. Fry for almost 1 minute, may be a little bit more until the outside gets a nice light brown color. Turn heat down to 340 or medium and continue frying for 3-4 more minutes. Transfer the Kibbeh to a plate lined with paper towel. Raise heat again for 30 seconds before adding the next batch of kibbeh and fry as before. Continue until you are done with them all. Notes1: It is recommended to use ground beef 91% or above. Note2: I’ve noticed many people like to make the filling with butter so feel free to substitute if you like. Note3: I was introduced to Kibbeh with pine nuts and that’s how I like it so far. You can make it plain and also many people use walnuts instead. Note4: I did not feel the need to refrigerate the mixture as I could handle it immediately. Note5: If this happened simply start over, if you are unable to roll the kibbeh without breaking the walls then may be it needs more water. You can take a small portion of the shell dough and add 1 teaspoon, knead it through and try again. 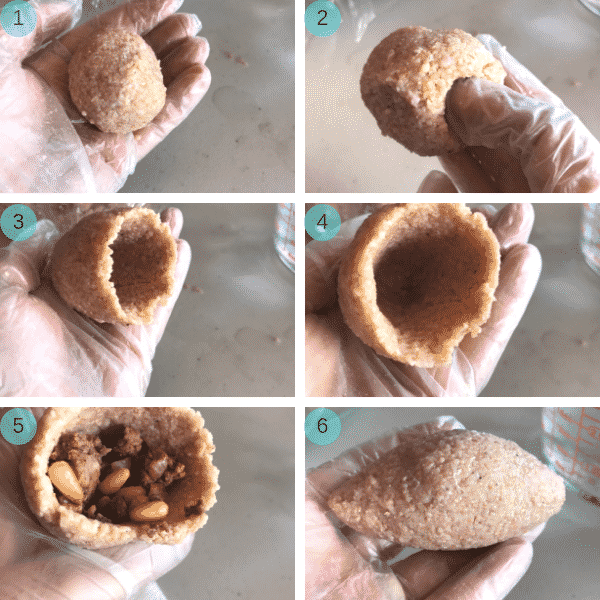 Note6: This is the traditional way of shaping and forming Kibbeh, there is of course an easier way by making the ball into a rough cup with 1/4 inch sides, spoon filling then gently close the ball and form into the baseball shape. This method is easier but I’ve noticed that the kibbeh walls does not come out uniform, meaning it is sometimes gets thicker from one side than the other. Note7: I was taught that the best way for kibbeh to fry well and not get opened in the hot oil is by freezing it overnight and that’s exactly what I did. Some experienced cooks say that no need to freeze and just refrigerate until it is firm. Note8: to know if the oil has reached the perfect temperature for frying, try dipping unvarnished wooden or bamboo spoon/chopstick. If the oil is hot enough, you’ll notice a steady stream of bubbles. Vigorous bubbles then it is too hot. Please note the time calculated for this recipe does not include freezing or frying time. Kibbeh is very much welcomed in my family too… Thank you, I hope you will try it out.